While I was in college, I worked at a darling tea shop in downtown Harrisonburg. It was the kind of place with only 10 tables but 100 different kinds of tea, the BEST scones baked fresh every morning, and a lunch menu that was short and perfect. Because it’s such a small establishment, I got to wear many hats while working there: hostess, waitress, tea aficionado, even prep cook! It was in that last role that I learned how to make some of the most simple and delicious lunch dishes I know. The chicken salad in particular was always a favorite of mine, and with my eating habits under check these days, I figured it was the perfect time to come up with a healthier version! 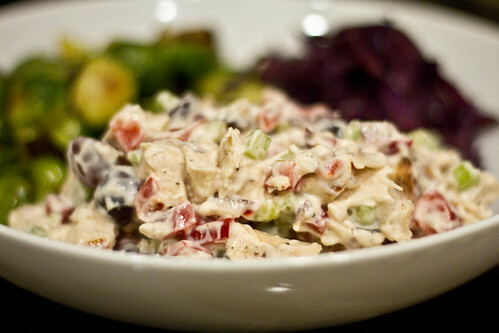 Traditional chicken salad, while delicious, is notorious for being drenched in mayo and with only a smidgen of celery to mix up the texture. 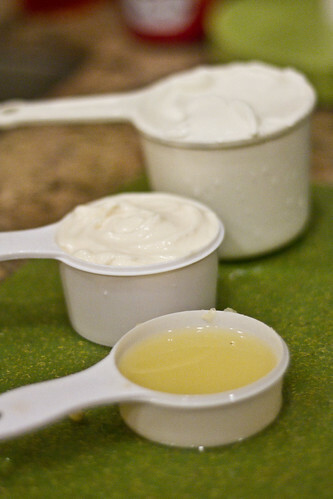 Using plain greek yogurt to replace mayonnaise is a common “healthifying” technique, but often gives a sour taste to dishes on its own. This bright, nutrition-filled recipe includes a myriad of vegetables and combines the yogurt with light Miracle Whip to provide a flavorful, creamy dressing that’s still light on calories. This dish does involve a fair bit of prep work (chopping, dicing, slicing, and the like) but the actual recipe is incredibly easy! One thing to note: this makes a LOT of chicken salad. I’ve found that if you mix the entire batch with the dressing together all at once and end up refrigerating any leftovers, they will get quite watery the next day. Therefore, my recommendation is that you add the sauce and salad components together in smaller batches, and refrigerate any leftovers separately. Obviously, this rule doesn’t apply if you’re making it for a party or large group though. Loaded with colorful veggies and the juicy punch of grapes in every bite, this easy, lightened up chicken salad is a perfect lunch dish! 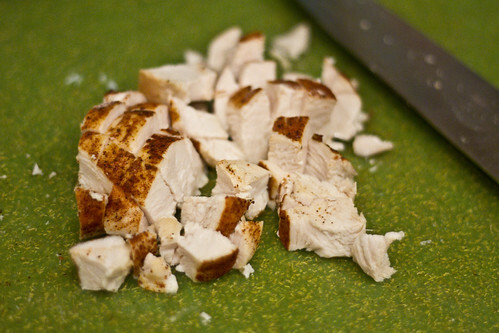 For the chicken, feel free to cook however you see fit: roast it, pan fry it, even boil it! 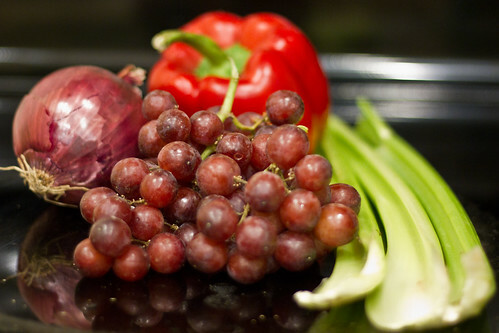 You can definitely adjust the ratio of grapes/veggies/chicken to your liking, as well. 1. Cook your chicken breasts in the way of your choosing (I seasoned them with a poultry rub and roasted them in the oven at 400 degrees for 20 minutes). 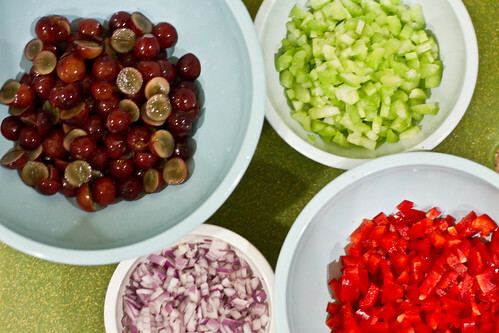 When they have finished cooking, chop and combine with onion, bell pepper, celery, and grapes. 2. 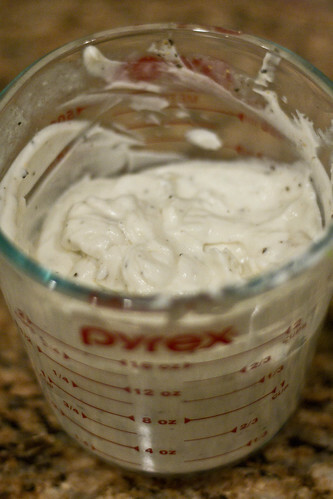 Mix yogurt, Miracle Whip, lemon juice, salt, and pepper in a separate container. Add to salad ingredients and combine. 3. Enjoy on toast, in a wrap, or on its own! 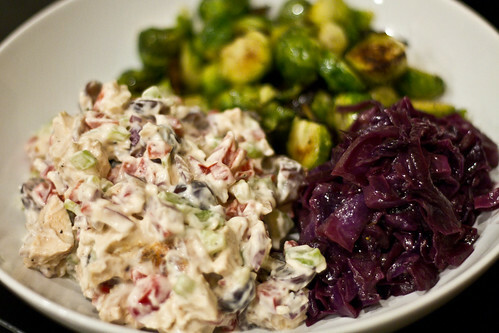 Served up with roasted brussels sprouts and balsamic braised cabbage for a rainbow-colored plate! Nutritional information per 1/8th serving: 160 calories, 3 grams fat, 10 grams carbs (1 gram fiber), 24 grams protein, WW Points+: 5. PS: Don’t forget that the Hello Hydration giveaway is open until Wednesday! This is very similar to my chicken salad except I put apples In it too. I make it a little smaller (and quicker) by shredding a rotisserie chicken. I hate mayo, so I usually use just enough to hold it together – maybe 1/2 cup for whole recipe. And I make my own mayo (so easy!) and I’m a little less grossed out by the off-white blob. Mmm, apples is a great addition! I was gonna say the same thing! My mom always puts grapes and granny smith apples in her chicken salad. Soooo good! I’ll have to test out this recipe! That plate is mouth watering! 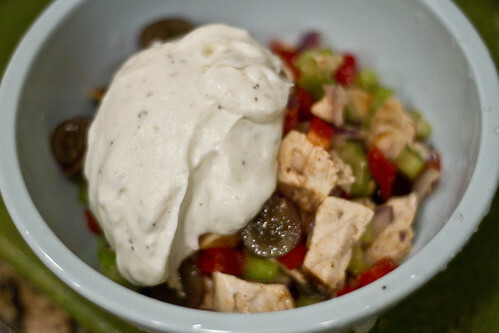 I love chicken salads with grapes and the fact that you subbed out all of the heavy mayo [not a fan] is awesome- def have me craving a big salad topped with some chicken salad! Or even in a toasted sandwich… Mmm! Lo, unto us She gave a yummy chicken salad recipe. And it was good. And lo, said the reader, “This shall be pinned”, and so it was put in the sacred Pinterest for all of eternity. Oh, Gretchen- this looks so good! I love all of those things in chicken salad (but I do NOT like Miracle whip!) I am also a huge fan of braised cabbage- I just made some the other night! I always forget how great cabbage is warm. Haha, I was actually going to write something about how I know that some people are pretty on the fence about Miracle Whip, but I think it’s delicious ahaha. You could still try this recipe using regular light mayo instead of MW, or you *could* try it with the yogurt only but again, I think it makes it a little too acidic on its own. I don’t even eat chicken but that looks yummy! Actually I should try to make a “chikn” salad with my fake stuff… hmmm good ideas! I see those brussel sprouts made their on your plate again. Delicious! Brussel sprouts, what a friend! Your chicken salad is quite similar to one I enjoy making, minus the celery, but with added dijan mustard to the dressing. Yum! Mustard is a must-have for me when it comes to tuna salad! This sounds SO yummy! How about I just swing by and you can give me some? K Thanks. I will definitely be giving this a go! I actually might have all of the ingredients right now! A good chicken salad recipe is something that everyone should have. I’m a big fan of the grapes and the apples mentioned earlier. Another great addition, that you might not think of, is fennel. I bought fennel today just to make chicken salad. It gives a nice little kick to the salad. Nuts are a great addition, too! 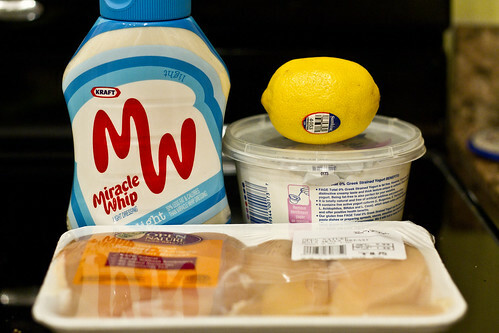 I love that you use Miracle Whip…that little dressing doesn’t get enough attention these days. Do you just chop the fennel to a similar size as the veggies, or is there anything else you need to do with it? Funnily enough, I’ve never prepared anything with fennel in it before! You just chop it up! It’s a really great veggie…I love it. It adds a little licorice flavor to things, which is weird because I hate licorice but I do love fennel. sounds delicious, must try soon!! Thanks for posting, i made it with some leftover turkey we had…yum! these crisp and cool chicken salad have a refreshing combination of ingredients to satisfy your taste buds while giving you the nutrition you need.